No Feet in the Pool! After we adopted A.J. and realized how crazy he was, people who had experience with Springer Spaniels told us they tend to calm down when they turn three. A.J. turned three a week ago, and he’s been more obnoxious this week than he has been in quite some time. It started with chewing up my backpack. Then yesterday he got really crazy. Greg and I went for a long bike ride. We were gone for several hours, and when we got home the temperature was hovering around 100 degrees. As soon as I walked in the door I took off my shoes and socks, got a glass of ice water, went out back and right into A.J.’s wading pool. This, of course, got A.J. very excited. He stood outside the pool and started barking at me. It was funny for the first few barks, but then he wouldn’t stop and kept getting more excited. I told him to stop, which he did until I moved, splashing the water a little bit. He started barking again and finally jumped into the pool. Then he decided he needed to get those things (aka my feet) out of the pool, and started trying to bite at them under the water. I wasn’t at all happy about that. So I got out of the pool and called A.J. out. Then I stepped back into the pool and told A.J. to lie down. He barked but went down. Then he got up. I told him “Down,” he barked and lied down. Then he got up. I told him “Down,” he barked and lied down. Still in the pool, I knelt in front of him and reached out to him. He tried to grab my hand. I grabbed his nose and told him “NO!” I stood up and we just stared at each other for a minute. Finally A.J. kind of looked away and relaxed and wiggled a little. I knelt down again and petted him and told him he was good. Then I stepped out of the pool, released him from his Down, and petted him some more. I pulled a chair up to the pool, sat down and put my feet back in. A.J. jumped in and stood in front of me, and I petted him. Then I called him out of the pool over next to me and petted him some more. He was much better from that point on. 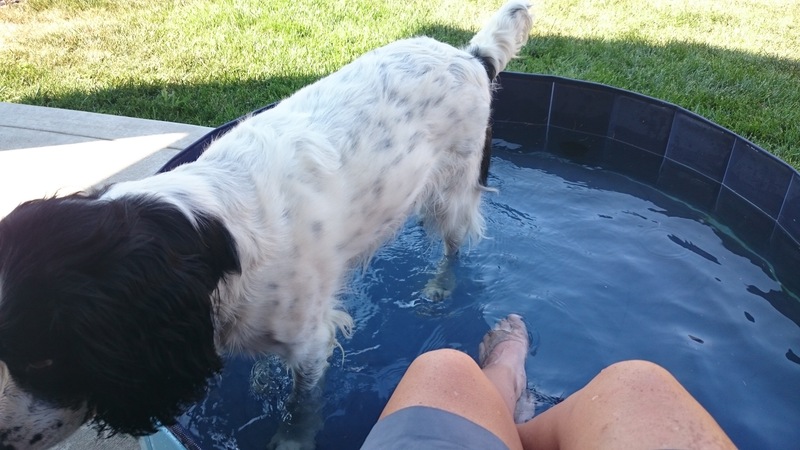 He still got very upset if I splashed the water at all, but he didn’t try to get my feet out of his pool again. Wading pools are for sharing.